ZIMBABWE – President Mugabe has slammed corrupt judges whom he accused of abusing their professional independence to make biased decisions in pursuit of certain political agendas. In a speech read on his behalf by Vice President Emmerson Mnangagwa at the opening of the Southern African Chief Justices’ Forum conference here yesterday, the President rapped judges who behave like politicians. The five-day conference is running under the theme; “Guaranteeing the Right to Fair Trial in Africa: Showing Best Practices”. Chief justices from 13 countries in Southern Africa and several judges are attending the conference. “Judicial independence, as a concept, is noble when used appropriately to uphold the separation of powers. It is, however, sometimes abused by some judicial officers to mystify and stem criticism of untenable court decisions,” President Mugabe said. “We respect judicial independence, appropriately raised, but deplore judicial officers, who are in essence politicians, hiding behind the cloak of judicial independence, to mask their political inclinations,” he said. The President urged chief justices in Southern Africa to establish mechanisms to curb corruption and bribery in the judiciary, saying rich, but guilty people were being let scot free by the courts. “If we all accept the depiction of justice as blind or blindfolded, then why do some judges appear to see and recognise the status, title and money that the litigants, who appear before them, have? “If we accept that justice wields a scale in one hand to weigh the evidence that each party places before the court, how then does it appear, sometimes, that the scale tilts heavily in favour of the party who has produced very little or no evidence at all? asked the President. “If justice wields a sword in the other hand, why does that sword never fall when all other reasonable people expect it to fall and the guilty are set free? “Sadly, we receive reports that some judicial officers may not be exhibiting the levels of integrity that the office demands,” said President Mugabe. 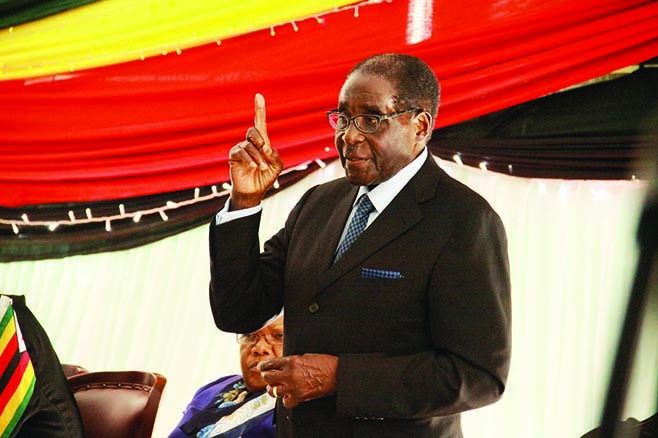 Chief justices, President Mugabe said, had a duty to come up with strategies to curb graft. “Judicial corruption erodes any confidence that the populace and we politicians have in the judiciary. “It is my hope that you, honourable chief justices from the region, will take charge and play a leading role in eradicating corruption wherever it may rear its ugly head,” he said. He said if the judiciary was compromised its checks and balances on other arms would be questionable. “If, therefore, the judiciary is compromised, then the checks and balances it seeks to exercise on the other two arms of the State, is skewed, not in favour of the interests of the State, but in some other interest, which remains unarticulated and therefore, unknown,” he said. President Mugabe said Government respected the judiciary and accepted its judgments and interpretation of the law although it also had powers to modify the law where necessary. “We have always and will always respect the judiciary and its pronouncements on the law, even when its interpretation of the law and our understanding of the same do not coincide and sometimes, I admit, we have voiced our incredulity at such rulings, perhaps too loudly and perhaps too publicly,” he said. “Respecting the role of the judiciary and their pronouncements on the law does not mean that we then abdicate our role to govern. “Where appropriate, we modify the law to suit out policies and allow the courts to interpret that new law,” said President Mugabe. The crafting of the Judicial Service Act in 2006, which separates the judiciary from the Civil Service, was another giant stride in promoting judicial independence, President Mugabe observed. Inordinate delays in handing down judgments, the President said, was rather judicial “indolence” than independence. “We often have horrific accounts of persons staying in prison for years, while waiting for the courts to hand down judgment. “I have doubted that this is caused by the independence of the judiciary, but, with greatest respect to all honourable judges here present, this to me smacks more of judicial indolence, rather than judicial independence. “To my thinking, one’s conscience must tell one that he or she is not serving the interests of justice, or of anyone else for that matter, by delaying the handing down of judgment in that manner. We do not encourage that in our courts,” he said.